I wiped my drive did a fresh install of windows, my main SSD where my operating system is fine however my extra HDD is starting to die any help? are we referring to a spinning drive beginning to die? Any storage drive should never be pushed to 100%. Your immediate task is to erase enough stuff to take it down to say 85%, either via erasing or move to an external HD/dongle. I have also just now used a new HDD and the same issue persists what could be the issue? What is exactly is dying and where is the proof? click on it so that you can see what exactly is using that 100%. Superfetch and svchost comes to mind. Posting a screenshot wouldn't hurt. I'm sorry to the mods if this message seems spamming, but I created an account to answer a lot of these same questions, to which I also had a problem for and recently "resolved"
but honest a quick search on google comes up with lots of potential solution. I would start by reinstalling your storage driver (There are knonw problems the base microsoft driver). 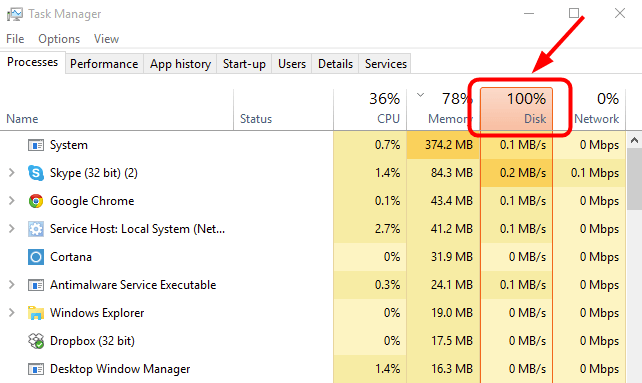 If your disk usage in Task manager is off the chart, especially after Patch Tuesday update on Windows 10, you're not alone. Here are 8 can't-miss fixes for you to try. One of them is bound to fix your 100 % disk usage problem. Start at the bottom and work your way up. You shoudl not need to message around with all those other settings. The 100% issue is something fundamentally going wrong with some firmware/driver/software and not any specific windows feature. Question 100% disk usage on Windows 10, cannot solve at all? Question Can I partition an external hard drive for Xbox and PC usage? Question How to stop Disk usage going to 100%? Question good pc stuttering in newer games?